As their jobs change, workers will constantly need new and deeper skills to cope. Modular courses could be one of the ways to enable them to keep pace as they enter a future that requires lifelong learning. 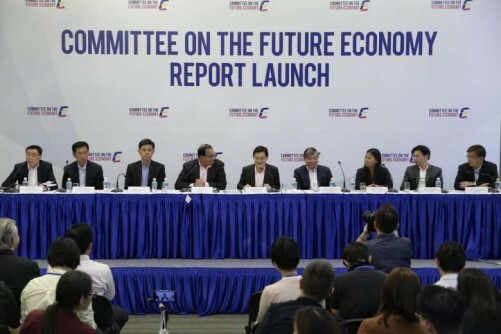 Helping workers acquire and use deep skills was one of the seven strategies spelt out by the Committee on the Future Economy (CFE) yesterday to prepare Singaporeans for upcoming challenges. As technologies and jobs are likely to change at a faster pace, "we must go beyond the pursuit of the highest possible academic qualifications early in life, to seek knowledge, experience and skills throughout life", said its report. The deep skills should also be relevant to workers' jobs, the CFE noted, while making a set of suggestions on how these could be acquired. It acknowledged that there would be a challenge in acquiring such skills, as working adults would have to balance personal development with other priorities such as family and career. That is where modular courses could play a key role. These courses are broken down into segments, making it easier for workers to learn at their own pace, hence offering greater flexibility to those juggling work and reskilling. The panel wants the Government to work with training providers and institutes of higher learning to roll out more of such courses. These programmes should be endorsed by companies and approved by the Education Ministry, and be accessible online, it said. Skills training under different qualification frameworks should also be more integrated. For example, graduates of SkillsFuture Earn and Learn programmes could progress to applied degrees with relevant modules exempted. Another set of recommendations the CFE made was on encouraging employers to develop staff. The report highlighted the SkillsFuture TechSkills Accelerator, which helps infocomm technology professionals deepen their skills and workers from other industries pick up digital skills. It gets employers involved to offer on-the-job training and secondments, which ensure trainees pick up skills that are relevant to their work. The committee suggested implementing parts of this model in other sectors. In the urban solutions growth cluster, for example, Singaporeans could take up place-and- train positions in law firms, engineering consultancies and multilateral development banks. They could later be given project structuring roles in these banks and in advisory firms. The Government could even give companies preferential treatment for some schemes if they use skills- and competency-based HR systems to hire and promote staff. Finally, the committee highlighted the need to support workers. Job seekers with the right skills may still miss good opportunities because of a lack of information. To minimise this, the Government should make the National Jobs Bank more useful and user- friendly, the report said. New opportunities for contract and freelance workers should be embraced as part of an innovative and entrepreneurial economy, and these workers should be supported in their retirement adequacy. The committee recommended having more professional conversion programmes to enable older job seekers to pick up new skills and switch to growth sectors, appointing more institutions to provide job-matching services, and improving support schemes for low-wage workers. Minister for Finance and CFE co-chairman Heng Swee Keat said at a press conference yesterday that developing Singapore's workforce will help the country stay relevant to the world. He said: "This has just been ignited with SkillsFuture to support lifelong learning. "The CFE recommendations take it further, to also focus on skills utilisation, meaning it is not just about acquiring skills, but also using those skills on the job effectively."